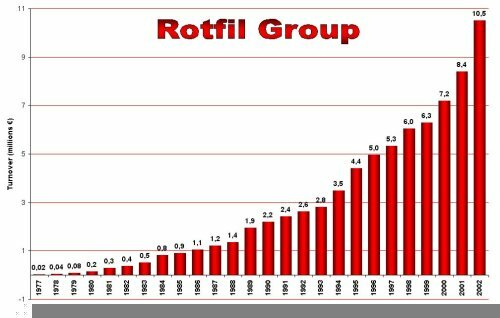 Rotfil is the No.1 manufacturer of cartridge heaters in Italy. Certified ISO 9001:2008, we offer a wide range of electric heaters, temperature sensors and temperature controllers for industrial applications: mini-coil heaters, nozzle heaters, band heaters, heating cables, infrared heaters, custom heaters, flexible heaters, PTC heaters, air heaters, mica and ceramic heaters, cast-in heaters, drum heaters, finned heaters, immersion heaters, tubular heaters, high power density cartridge heaters, middle power density cartridge heaters, low power density cartridge heaters, etc. The Rotfil product range is the largest available in this field from a single electric heater manufacturer. The wide range offered and the technical excellence of our products are the result of an unequalled experience and our policy of continuous technical research and improvement. Founded in Italy in 1977, today Rotfil is comprised by a group of companies (Rotfil srl - Rotfil NA - Jeka - Termax - Infraker) situated in modern manufacturing locations in Europe and overseas, supplying customers with standard or customised high-quality solutions for almost any electrical heating application. Finding the right product for any new application, and bringing it to the highest level of technical excellence, an endless dedication that has resulted in a steady growth of the company and business making Rotfil a European leader in this field.